There was a time, when I was interested in the Atari VCS 2600 – programming it, I mean. As a kid I used to have one (must have been around 1980ish). I remember having had at first only pacman as a cartridge. I could (and did) play that one for hours. After a while I even invented new game modes 🙂 (like turning down the brightness of the TV, so that only pacman and the ghosts were visible (not the labyrinth) – and still being able to beat the game). 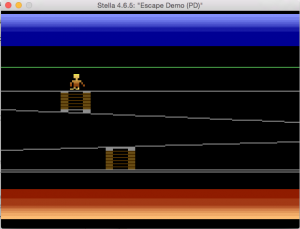 Anyways, I started out to do a bit of programming, the idea was to build a “Jumpman” (a game I knew from my C64 days). I don’t exactly know what diverted my interest, since I stopped “halfway”. 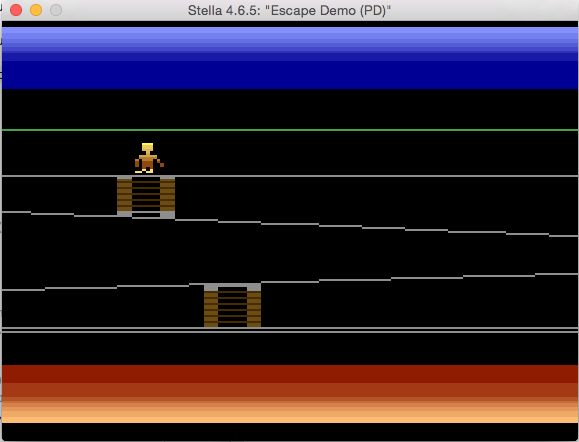 Above is an image of the latest version I developed, the little man can be moved around – that’s about all it does. I probably will never go back to finish it, but here is my little shrine to celebrate the hours I invested in that weird programming of the VCS 2600.